Made of selected wood, complete with pencil groove and single metal edge. 11/8" wide and 5/32" thick. Rulers show 1/16" on one edge, millimeters on the other. 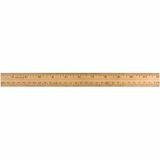 Plastic rulers feature double beveled edge with pencil groove. Raised calibrations show 1/16" on one edge, millimeters on the other. Assorted colors include white, yellow, red and green. Rulers that measure up to the test. 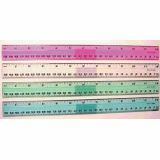 Transparent 12" Ruler other side 30 cm Assorted Colors. Double beveled. 1/16" scale on one edge, millimeters on the other edge. Natural finish. 1 1/8" wide x 5/32" thick. Pencil groove and single metal edge. Holes allow storage in a ring binder. Single metal edge. Multiple coat lacquer finish. Scaled in sixteenths with a single bevel. 11/4" wide and 1/4" thick. 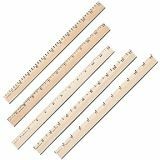 Office Desk Rulers, Wood, 24"
Etched markings for accuracy and long life. 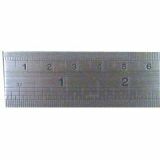 12 inch ruler with metric on opposite edge. Conversion table on other side. Hanging holes for easy storage. Includes vinyl sleeve. Single scaled ruler. Selected wood, multiple coat lacquer finish. No metal edges. 7/8" wide and 5/32" thick.